Primary Election day is Tuesday, June 7. Polls open 7 am to 7 pm. The New Mexico Secretary of State Website has a useful voter information guide. It’s easy to inquire about your voter status at Voter View where ou can find out your polling place and all of your districts. 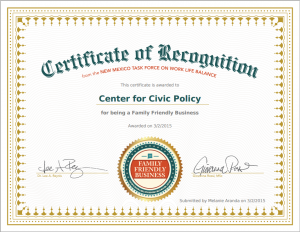 The New Mexico Family-Friendly Business Award was created by the Task Force on Work Life Balance to recognize New Mexico employers and businesses that offer family-friendly employee benefits and promote increasing the number of businesses with family centered polices and work force access to them. 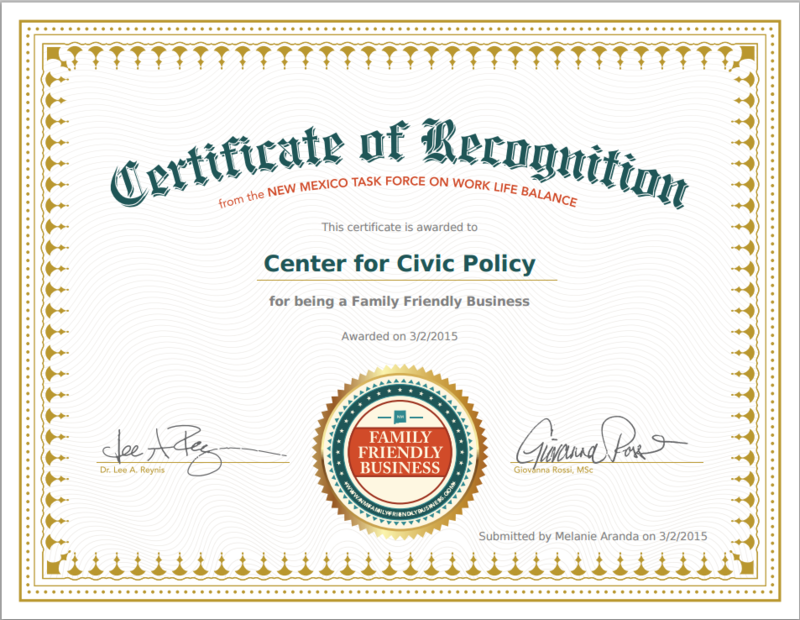 The board and staff of the Center for Civic Policy are proud that our organization has been recognized as one of these best practice family-friendly work places. Best practice employers foster flexibility to achieve a better balance between work and family responsibilities for all employees. From reduced absenteeism to improved productivity and job satisfaction, there are significant benefits for employees and employers in providing flexibilities for work and family balance. Work and family flexibilities ensure employers and employees balance work and family commitments by using employment arrangements that help employees manage family and lifestyle commitments while taking into account business needs. The benefits of work and family flexibilities can be achieved in all workplaces, regardless of the size of the business, by developing and implementing family-friendly workplace policies. Will she or won’t she? That IS the question. As Sarah Kennedy explains, time is running out! Countdown to adjournment at noon. Here’s the Roundhouse liveblog, courtesy on NMPolitics.net. It’s live and it’s real. The gang at NMPolitics.net is going all in. Heath, Gwyneth and our very own Matt “Red Bull” Reichbach, along with the usual cast of journalistic characters, will be liveblogging the N.M. Legislative until the session adjourns tomorrow at noon. You can follow the action here. Many thanks to Heath Haussamen and Gwyneth Doland for letting us join in.